Practical, clinically focused, and highly illustrated, this new guide includes content not covered in any other book, presented in a user-friendly format. Part I introduces the concepts of subjective evaluation, observation/posture, related referral joint testing, neurovascular testing, palpation, and range of motion testing. Part II comprises the bulk of the text, covering the major shoulder tests that clinicians perform. Part III features supplemental tests used in the clinical setting. Finally, Part IV pulls all the information together by testing students and clinicians alike with a series of case studies. The reader will also find extensive, up-to-date references for further research or study. The first text devoted solely to the musculoskeletal examination of the shoulder joint. Emphasizes research and objectivity, providing easy access to current research quantification of test procedure efficacy indication and clinical application. Contains an exhaustive review of examination and clinical tests, leading to a more accurate diagnosis and better course of care. Presents a combination of clinical tests, functional evaluation parameters, throwing and interval sport return/evaluation procedures, as well as seldom-presented closed chain tests, offering the practitioner a plethora of alternative tests. Highlights new tests for the shoulder, particularly in the area of labral and instability testing. 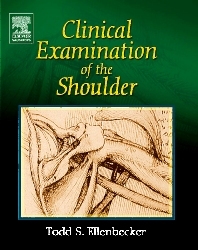 Places a high degree of emphasis on documentation of test results, increasing the reader's objectivity of the shoulder exam process. Includes various combinations of patient presentation, emphasizing classic diagnoses and the combinations of test results from the evaluation procedures covered in the text. Case studies permit readers to test themselves and apply their knowledge to varied situations.